THE benign mychorrhizal fungi live in a mutually beneficial arrangement in the roots of most plants. They help the plant absorb essential nutrients like phosphorous and in return receive carbohydrates from the plant. But they do not bond with major food crops like rice. Swiss researchers recently claimed they can make a species of mychorrhizal fungus bond with rice. The species, Glomus intraradices, has an unusual genetics. Each filament of G intraradices contains genetically distinct nuclei. But since it reproduces asexually, the genetic recombination does not occur. The ecologists at the University of Lausanne in Switzerland took spores of two G intraradices fungal filaments and fused their nuclei in the laboratory. The resulting spores had a different genetic combination. The researchers then cultivated the crossed fungi for three generations in the laboratory and inoculated rice saplings with different generations of fungi. Writing in Current Biology on July 13, the scientists said the method is natural and not genetic modification. Lead researcher Ian Sanders said, “What we did is not different from what plant breeders do to improve crops.” The only difference is that the genetics of these fungi is a little bit more unusual, and no one thought it worth doing, Sanders added. 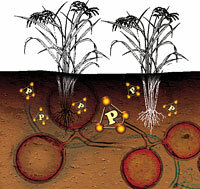 His team hopes hybrid fungi can help plants use phosphorous present in the soil in complex forms. Asia consumes more phosphorus fertilizer in proportion to crop yield than other regions, said biologist John N Lott, of McMaster University in Canada. With global shortage of phosphate in the soil predicted in the coming decades, mychorrhizal fungi developed through genetic recombination would reduce the use of fertilizers, Lott added. Roland Buresh of the International Rice Research Institute in the Philippines, doubts if the fungi, which requires oxygen for growth, would grow well after being transplanted into submerged paddy fields with limited soil aeration. The Swiss researchers acknowledge their work is not field-ready. Sanders is conducting field trials on potato and cassava with the National University of Colombia. He has been able to produce the same amount of potato with less than a third of the phosphate fertilizer normally applied. Thanks for this information. Since a large portion of maize crops are grown for purposes other than human consumption, rice is the most important grain with regards to human nutrition and caloric intake, providing more than one fifth of the calories consumed worldwide by the human species. You may visit pdfph.com for more information about this product.